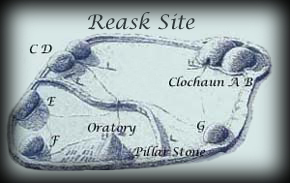 There is no record of the early ecclesiastical site at Reask, but excavations which took place in the early nineteen seventies revealed an oval shaped enclosure with a cashel type wall. This wall is around 2.2 metres in width and at its highest point is about 1 metre high. 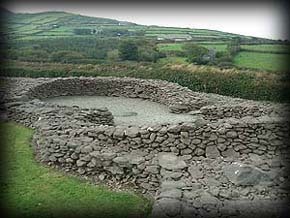 Inside the walls are the remains of several clochauns, a stone oratory, a rectangular structure and two other circular huts. Excavations also revealed a cemetery with over 42 lintel graves. Also revealed were a number of Ceallunach graves. Scattered around the site are a number of cross slabs and pillar stones. Pictured left is a beautifully inscribed pillar stone decorated with a Greek cross in an inscribed circle with pendant spiral designs terminating in a pelta. This stone stands at 1.65 metres high and just over half a metre wide. 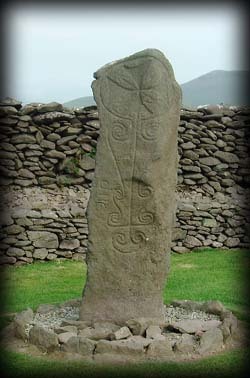 Stone B, pictured right is a sandstone slab standing at the entrance to the oratory and is part of the ceallunach enclosure. This stone is 0.8metres in height, 0.4 metres wide and 0.2 metres thick. It is decorated with a large Latin cross with bifurcated terminals. Above the cross is horizontal bar also with bifurcated terminals and on the upper sides of the cross are inscribed two smaller crosses. Stone C not pictured was a sandstone slab also decorated with a Latin cross. 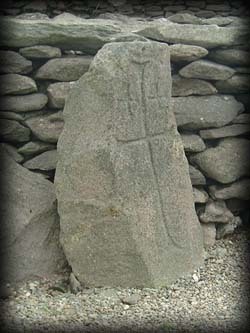 Stones E, G and H can be found in the West Kerry Museum in Ballyferriter, it is a sandstone slab decorated with a Greek cross. Stone F was removed to University College Cork and is decorated with Latin crosses on both faces. 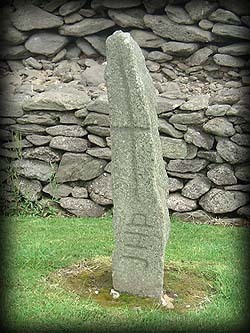 Also decorated with a Latin cross is Stone D, pictured left, below the cross the letters DNS for Dominus are inscribed. The opposite side, pictured above bears a Latin cross with the letters DNO for Domino, The stone is a narrow sandstone pillar at 1.14 metres high, 0.18 metres wide and 0.14 metres thick. 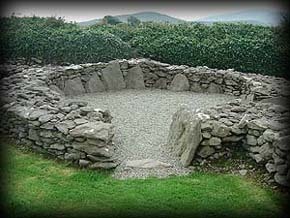 Clochauns C and D are conjoined in a figure of eight, Clochaun D pictured right, has large slabs set on end with dry stone walling on the outside. as you can see in the pic there is a jambstone on one side of the entrance and there is also a jambstone between clochauns C and D. The internal diameter of clochaun D is About 4 1/2 metres. Situated:Take the R559 east from Ballyferriter after 1 kilometre just after the left turn for Ballinrannig, take the next right turn then take the next left, the site is immediately on your right. Discovery Map 70: Q 3666 0442. Last visit July 2011.